Announcing the winners of the 37th ever Right Place Photo Caption Contest, brought to you this week by the Cleavon Little Memorial Marching Society! Presenting the top 15 captions for this picture from REUTERS/Sean Gardner via Yahoo! #15: "Pardon me while I whip this out..."
#14: "I was going to use coconuts, but the store was fresh out." #13: Mayor Nagin campaigns as Army Lt. Gen. Russel Honore, hoping that people will be confused enough to actually re-elect him. #12: "Call me 'Che', children." 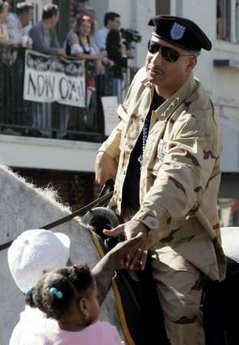 #11: Not wanting to be caught unprepared again, Mayor "Generalissimo" Nagin picks up riders while personally supervising drills for New Orleans' new disaster evacuation plan. #10: During Mardi Gras, Nagin plays the role of the lesser known, Fifth Horseman of the Apocalypse: Incompetence. #9: "See! I'm riding a VANILLA horse! Together, we make a delicious drink." #7: "Don't you worry, little Raisinets; Sugar Ray Nagin is gon' make sure this city stays chocolate." #6: "No, I cannot stay, there are other towns out there that need to be destroyed by my gross incompetence. Farewell." #5: "Take back your stupid quarter and tell the kid she can't ride on the supermarket horsie ride till I'm done." #4: "Ray Nagin, Delta Rush Chairman.... damn glad to meet ya." #3: "Hey! The Sheriff's a Nagin!" #2: "Gosh, Momma, I've never seen a four-star moron before!" #1: During the first annual "Stuck on Stupid Parade", Grand Marshall Nagin greets the spectators. --Sung To "Swing Low Sweet Chariot"
A band of new homeless people gunnin' after me.